I am a Learning Enhancement and Technology Adviser in LTDS and have worked in e-Learning for the past 8 and a half years, both as a staff trainer and as a manager of online content and resource development. Prior to this I taught in both primary schools and in FE and always used technology where possible to enhance the learning experience. Many staff often request for modules to be joined together on Blackboard where the content delivered on those modules is the same. When this happens, we create what is called a parent-child module. The existing modules become child modules of a newly created parent module. Combining the modules in this way means that the content only has to be added to the parent, but students continue to see the content via the child module they are enrolled in. This is a reminder that Blackboard will be unavailable tomorrow, Saturday 4th August 2018, between 7am and 5pm in order to upgrade the system from the 2017 Q2 release to the 2018 Q2 release. We will update you once the upgrade has completed but if you have any questions in the meantime, please don’t hesitate to get in touch with LTDS@ncl.ac.uk. Another Course Build focus group took place on Thursday 2nd February at the Business School. This session was primarily attended by staff from the HaSS Faculty with representation from the Careers Service. Since my last post we have held three more focus groups to gather requirements for the University’s future VLE provision. A group of Professional Service staff from across the University met on the 24th January and had a very productive discussion which resulted in a lot of requirement gathering. This was a more general focus group spanning all themes; course build, assessment and feedback and communication/collaboration. It was very important to hear about the features in our current provision that staff feel are essential. We need to ensure that these are not lost through the procurement process. On the 25th January we ran the only communication and collaboration focus group as the first session was cancelled due to low numbers. Unfortunately, only half of the staff who had signed up were able to attend but we were still able to gather many requirements. A big focus of the session was on discussion boards which were seen as an essential tool within the VLE, particularly on modules that have online elements. Improving the interface and user experience across many of the collaboration tools was a common feature of the discussions. Yesterday, 29th January, the second of the assessment and feedback focus groups took place. This was a well attended focus group with very lively discussions. The session had representation from staff who use Blackboard and staff who use the LSE, the VLE used on the MBBS programme. It was interesting to hear about the functionality currently available on the LSE and how this would be useful on other courses outside of the MBBS programme. There will be free pizza!!! The next stage of the consultation phase will be to invite suppliers in (March-April) to present their product to us based on the outcomes of the survey and focus groups so look out for invites to these events soon. The requirements gathered will be tidied up and sent to the members of the Task and Finish Group once all the focus groups have taken place. A second Assessment and Feedback session will take place on the 29th January 2018 in which we hope to gather further requirements. There are no spaces left on this session but if you would like to share your thoughts, please send the project team an email and we will be in touch. There is an additional Course Build focus group taking place on the 1st February 2018 1.30pm-3.30pm and there are limited places still remaining if you would like to sign up and share your thoughts. 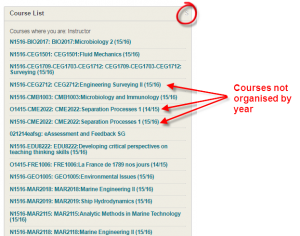 It can be frustrating seeing your Blackboard modules in one long, unorganised list on the My Institution page, but did you know that you can group them by academic year? To do this hover your cursor over the Course List menu and you will see that an S symbol becomes visible in the top right hand corner. This will open up a Personalise: Course List menu. 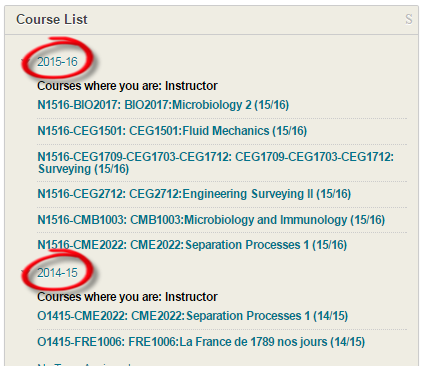 Select the option to Group By Term , choose the years you would like to view and then click Submit. 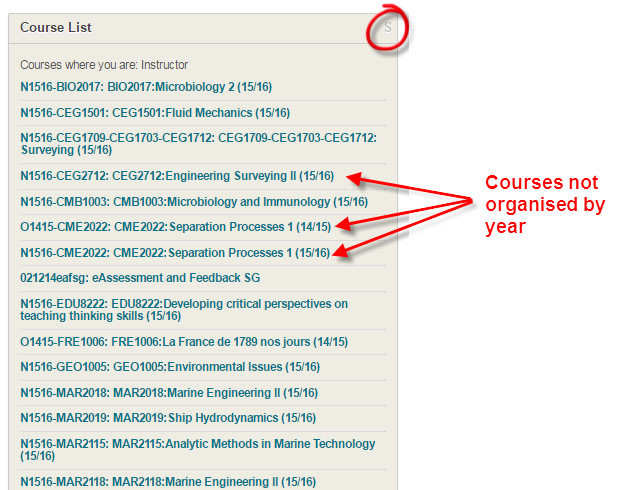 You will now see that your modules are arranged by academic year with the most recent displaying first. This is a very useful tool tip if you are enrolled on a large number of modules. On Saturday 16th December Blackboard will be unavailable between 8am and 5pm in order to install a critical update. Firstly the update will fix many system bugs including notifications of discussion board posts and a Grade Centre scroll bar fix where the scroll bar obscures a Grade Centre column. Blackboard has two assignment handling features: Turnitin and Blackboard assignments. The Blackboard assignment tool uses third party software licensed by Blackboard which enables assignments to be viewed and graded online and this will no longer be available from 15th January 2018. A replacement document viewer and online grading tool will be available following the Blackboard update. 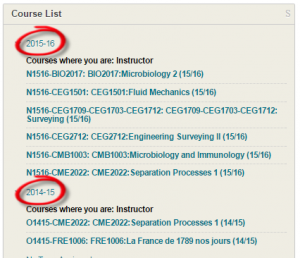 Once the update is completed on the 16th December, you won’t notice any changes to the Blackboard assignment feature. We can make the decision when to change to the new tool up until the 15th January. We plan on moving to the new tool w/c 8th January and we will communicate an exact date prior to then. Turnitin assignments remain unaffected so if you use Turnitin assignments rather than Blackboard Assignments then this change will not affect you. When we move to the new document viewer and online marking tool all assignments using Blackboard Assignments will switch over to the new interface. Any annotations carried out using the old grading tool will be burned in to the document and will no longer be editable. You can make additional annotations on the assignments if necessary. New assignments created will use the new viewer and marking interface. Assignments can no longer be downloaded with annotations and comments displayed. Blackboard are reviewing this functionality. We will keep you updated about this over the coming weeks but please note this DOES NOT affect Turnitin assignments. Any questions about this please contact LTDS@ncl.ac.uk.